[Stephanie Warfield] Stephanie Warfield commands the Furies, a rebel chapter of Space Marines sworn to the serve the Emperor himself, in defiance of the Adeptus Terra. The Furies and their allies, human and alien, patrol the galaxy in secret, fighting chaos and evil wherever they find it, joining with Imperial forces where possible, but fighting them if necessary. Stephanie is a determined, charismatic leader - her dream of a time when humanity will learn to control its chaotic nature is now shared by the Furies and many they have encountered since the beginning of their crusade. 940.M41: Tracked and killed the chaos lord known as 'Plaguemaster' on Thadran Secundus. Led defence of cities on Thadran against Plagemaster's warband. Infiltrated Ork horde on Monarch Prime and killed Warboss Uznar 'Star Lord'. Rescued survivors before Imperial bombardment began. 943.M41: Led Furies against Space Wolves fleet to protect Eldar craftworld Zaran. Later repelled Spave Wolves assault led by Ragnar Blackmane on Furies flagship Artemis. 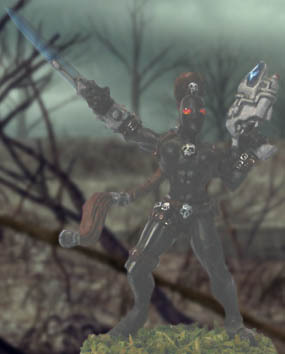 Joined forces with Imperial pursuit force intended to destroy the Furies when both armies came under attack from Dark Eldar raiders on Coriana. 944.M41: Led boarding actions to cripple Hive Fleet Trident after Sisters of Battle discovered evidence of Tyranid infiltration ahead of the Hive's course. Hive Fleet Trident left dead in space after all norn queen ships are cleansed. 947.M41: Commanded Furies fleet against aliens known as 'Outsiders' attempting to invade Segmentum Solar through the Volcano warp gate. 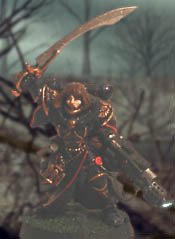 Led a strike force that tracked down Invisus, chaos lord and former Lieutenant of the Sons of Horus. 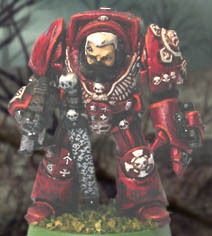 Invisus and his bodyguard warband were destroyed in battle. Stephanie's outward appearance, an attractive young woman, conceals a massive depth of experience. 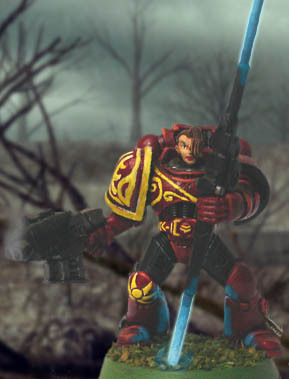 On first sight she does not appear to be a warrior - she has a certain innocent quality that, so it seems, could not have survived through the terrors of warfare in the 41st Millennium. Those who do not know her would believe she had the ability to lead and fight by instinct, as she seems never to hesitate or falter. In fact she is her own harshest judge, continually evaluating her actions and motivations. She knows that, as a leader, she must never seem indecisive - in battle she is determined and ruthless, achieving her goals with the minimum possible loss of life. But alone she questions herself, trying to ensure that her goals are as noble as her followers believe them to be. Her greatest fear is that she will lose her grip on humanity, and become merely another powerful, charismatic warlord. This, and her tendency to assume the best of people - often leading to disappointment - have in the past led her to deep depression, and the fear that she may be fighting a losing battle against chaos. She draws confidence and inspiration from her soulmate Alisha Selene, whom she trusts more than she does herself. She now battles chaos with the strong belief that humanity can prevail, and someday will do so. "It's easy to fall into the trap of the Dark Ages, to think that anything can be solved by technology. But machines are a tool, nothing more. We have to remember to be human, because that's where the only real power comes from." Although born on a relatively primitive Imperial colony, Alisha possesses an instinctive understanding of technology. Given the rare opportunity to explore her talents outside the restrictions of Imperial doctrine, she has created many technological innovations, most importantl among them the hyperlight drive used by the Furies to travel faster than light without resorting to warpspace. As Stephanie's lover, she is one of the few who know her origins and understand why she is determined to unite the galaxy against chaos - a goal Alisha now shares, having seen the destruction wrought by chaos first-hand. "I have been asked, by my former allies, how I can take orders from Commander Warfield. How could I not? I know my duty, and I am proud to serve in the knowledge that I never need doubt my Commander's loyalty to humanity." Though his skills as a warrior cannot be faulted, it is as a strategist that Octavian excels. He is responsible for much of the success of the Furies, achieving through careful planning and shrewd insight what might be impossible through force of arms alone. "This is a complex world we live in. Only in battle are things simple, when the enemy is to be destroyed and our own are to be protected. It is a harsh simplicity, and we must take care not to enter into it lightly." Tigrus is thought by many to be the greatest warrior in the Furies, aside form Stephanie herself. Although ill-at-ease with delicate situations, he is well aware that open conflict should be the last option, not the first. 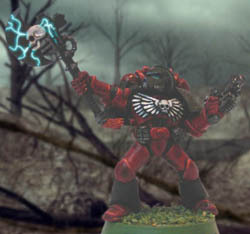 When battle becomes necessary he is the perfect leader for the Terminator company, a fearless warrior whose courage and determination count for as much as his strength and weaponry. "Those we fight against today, we may fight alongside tomorrow. But there are enemies who cannot become allies, who would steal what it is for us to be human. We must never stop fighting them, for if we do we cannot regain what we will lose." While still a child, Jennifer's home planet was overrun by genestealers. When war broke out between the stealer cult and the rescue force sent by the Imperium, Jennifer managed to break the alien hold on her mind and fight back. She was one of the first scouts recruited by the Furies after their secession from the Imperium, and her courage and strength of will have led her to become a captain. She continues to study the ways of genestealers, hoping to save others from the hell she experienced at their hands. "Obedience is built into every aspect of the Temple - every assassin obeys their orders without question. But sometimes, even under those conditions, it is just so clear that they are wrong." Liela was assigned by the High Lords of Terra to assassinate Commander Warfield after the Furies rebelled against the Imperium. In the time she spent infiltrating the Furies she began to understand their motives, and found that she agreed with them. She now uses her skills mostly to gather information from the Imperium, and is only rarely called upon to perform assassinations. Since Inquisitor Vail joined the Furies, Liela has travelled with her as a bodyguard and observer. "In one respect the Inquisition is correct: humanity has enemies in all places. Sometimes, though, the enemy of humanity is the Imperium." By concealing her true identity, Vail managed to become an Inquisitor, hoping to aid the cause of justice in the Imperium. For a time she worked within the Inquisition, in a frustrated attempt to reform the organisation, which had strayed from its original goal of protecting humanity and had become an enforcer for the wishes of the Inquisitor Lords. 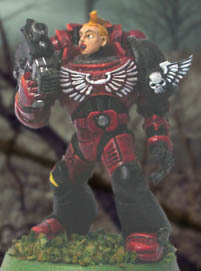 Eventually she was forced to choose between the Furies and the Imperium, and her sense of loyalty to the ideals of the Emperor lead her to choose the Furies. "We must never accept evil today while looking to tomorrow's good. Wrongs must be fought and righted, wherever they emerge, else all we do is worthless. It is not for us to judge which evils merit our efforts - if we honour our beliefs, we fight for the good every day of our lives." From the age of 14 Alana Devereaux was the leader of a small army of freedom fighters on the Imperial world Versailles, until she and her warriors were forced to flee when Versailles was placed under the direct control of the Minotaurs chapter. 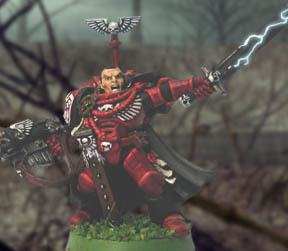 They joined the Furies shortly before the Coriana battle, and Devereaux later completed marine training and was assigned to the third company. Her expertise in strike warfare led to her quick promotion, and she now often commands detachments of the company. "Every day we face enemies, the creatures of chaos and the doubts within our own hearts. We must overcome both if we are to fulfil our duty to protect our people. Nothing, not even the Imperium, can claim greater importance than humanity." As a child, Susan Alexandra witnessed the execution of her father, falsely accused of heresy. 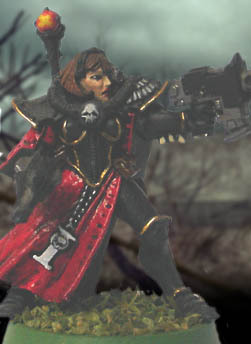 Orphaned by the Inquisition, she was taken in and raised by the Adepta Sororitas, but she never forgot the injustice that destroyed her family. When she was placed in command of the Order of the Black Rose, intended to hunt down the rebel Furies, she saw a chance to fight the injustice of the Imperium instead. Allied with the Furies, her Amazon Order now patrol the Imperium in secret, preserving the spirit of the Emperor against its enemies. "The Navy hates us, the Mechanicus hates us, the Administratum hates us, even General Diennes back in Segmentum Command hates us. We must be doing something right." Demure and her gang were recruited into the Imperial Guard after defeating a rogue Mechanicus force that had decimated her homeworld's planetary defence force. She has somehow managed to get an Inquisition letter of marque, giving her almost unchallenged authority over her command. As a result the 101st is either the Imperium's most eccentric regiment, or its best-equipped gang. The regiment travels on the hijacked Navy cruiser Dawn Hunter, generally ignoring orders but with a strange ability to turn up exactly where they are needed.